This was a modifcation of Simplicity 4059. All I really did is cut off some of the length of the peplum. The fabric is a brown and gold upholstery fabric I got at a going out of business sale YEARS ago. It was pretty basic. 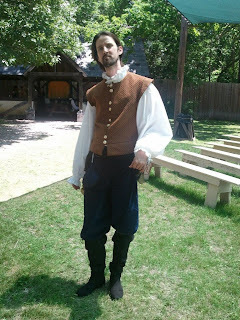 It also has matching sleeves that aren't in this photo because this RenFaire was in Texas... during the summer... therefore... hot. Same Simplicity pattern only the length of the legs were taken down to ankle length. Made from plain dark brown cotton. I'm trying to finish Crona for All-Con... and I REALLY want to make a Ragnarok backpack puppet to go with it... otherwise the costume is pretty plain. I will be making more costumes for McLennan Community College this semester. I'm not sure what I'll be making yet. I meet with the designer on Monday. AND, I'll be speaking at my old high school to the theater kids and possibly doing some costume work for them. OH!!! And before I forget! I got my panel schedule for All-Con... I'll be presenting at Noon on Friday and at 10 am on Sunday... Come by and say 'hi' and talk costumes with me!!!! Crona from the anime series and manga Soul Eater. Crona is the child of a witch who has a lot of issues... oh, and his blood was replaced with demon blood which manifests itself as a big parasitic monster thing. Despite all that Crona's a great character so I wanted to cosplay Crona.... notice the lack of gender specific pronouns? In the original, untranslated anime/manga, Crona's gender is never specified. 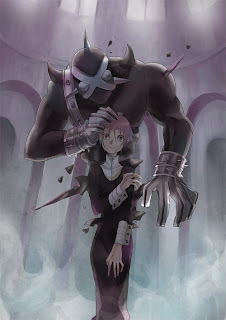 Although I think Crona's male in the English translations. So, anyway, I've started the costume... which is pretty simple -- of course I'm going to de-simplify it just to give it a little more interest... and also to challenge myself. Black Crepe Suiting I got at Jo-Ann Fabrics. The crepe has a little bit of a texture to it breaks up the light and doesn't look too cartoony even though it's a solid color fabric. You have to be careful with solid colors if you don't want a cartoon look. Wow... it's hard to believe ANOTHER year has flown by. And I didn't really make as many costumes as I have in previous years. Or maybe I made more... I'm not really sure... But here's the run down. First there were the costumes for The Chicken Opera, which can all be found in my Gallery. Remember, I made TWO of the White and Brown Chicken costumes. So there's 7. Then I made a shirt for my Renfairing... And I made a pair of Trousers that aren't shown here. So that brings the count to 9. By the way, I'm browsing through my blog entries to remember what all I've done. Can you believe this blog is a year old... well technically it's older but I didn't make my first post until January 2012 and here it is January 2013. I also made a pretty new Doublet for a friend of mine. 10. Then I finished off the year with some more theater work. 2 matching costumes, 1 velvet cape, 13 red capes.